Buy "Sun and Saddle Leather" today at the Heritage Store! His readers rode dusty trails, marveled at nature’s wonder, and loved and lost beautiful women. Badger Clark captured and expressed the essence of the West in his verses. “Sun and Saddle Leather,” the first collection of Clark’s cowboy poetry, was first published in 1915 and has been in print ever since. The South Dakota Historical Society Foundation, which is the nonprofit fundraising partner of the South Dakota State Historical Society at the Cultural Heritage Center in Pierre, oversees the reprinting and distribution of Clark’s work. Born on Jan. 1, 1883, in Albia, Iowa, Charles Badger Clark moved to Dakota Territory with his family when he was three months old. Clark took the doctor’s advice to move to a dry climate after being diagnosed with tuberculosis. He went to Arizona, where he tended a small herd of cattle at a ranch near Tombstone. Clark turned four years of cowboy life into a career as one of America’s most successful cowboy poets. He devoted much of his time in Arizona to writing, with his poems appearing in “Pacific Monthly” and other magazines. Clark’s stepmother, Anna, paid for the cost of publishing a book of his poems. The result was “Sun and Saddle Leather.” The book proved popular, and Clark was able to pay back Anna’s investment in the first year of its publication. Later printings of “Sun and Saddle Leather” included Clark’s second book of poetry, “Grass Grown Trails,” and nine additional poems. Various editions have been illustrated by drawings by the Southwest artist Edward Borein; photographs of cowboy life by E.L. Huffman; and, currently, drawings by Custer artist Martha Studt. 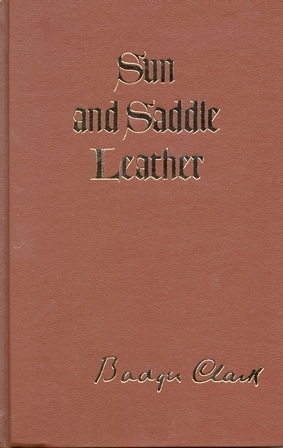 “Sun and Saddle Leather” contains several of Clark’s best recognized works. “Ridin’” was the first poem written by Clark to be published in a magazine and is the first poem in “Sun and Saddle Leather.” Versions of “The Glory Trail,” “A Border Affair (Spanish is the Lovin’ Tongue)" and “A Roundup Lullaby” have all been set to music. “A Cowboy’s Prayer” from “Sun and Saddle Leather” became one of Clark’s most popular poems. It appears on postcards, in greeting cards, and is read at rodeos. Don't forget to buy your copy of "Sun and Saddle Leather" at the Heritage Store.